+Nintendo is readying Pokken Tournament for a spring release on the Nintendo Wii U.
" the upcoming game that lets players battle as prized Pokémon in fighting arenas, will launch exclusively for Wii U on March 18 at a suggested retail price of $59.99. 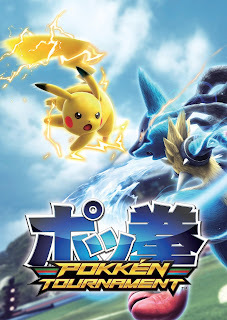 Pokkén Tournament brings high-definition game play and over-the-top action to never-before-seen battles between some of the most recognizable Pokémon characters. People that buy the first production run version of the game will also receive a special Shadow Mewtwo amiibo card, which can be tapped to the Wii U GamePad controller to unlock the Shadow Mewtwo playable character in the game. Sadly I have yet to play this game, and have been itching to play it since it was originally announced for arcades. Problem is there aren't many arcades around anymore. Even worst of the arcardes that are still lingering around only like 10% of them will carry the game. So my best option to play this game is obtaining it when it released March 18, 2016 (3 days after my birthday). I'm looking forward to getting my hands on this one.